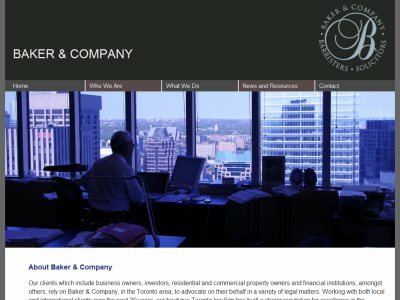 Baker & Company is a law firm in Toronto, Ontario. 30+ years of experience. Practice Areas: Real Estate Law (Residential Real Estate, Commercial Real Estate, Expropriation Law), Corporate Law (Commercial Lending, Commercial Transactions, Corporate Law), Litigation (Administrative Law, Civil Disputes and ADR, Employment Law), Wills and Estates. Clients include business owners, investors, residential and commercial property owners and financial institutions, amongst others.